I'm a big proponent of content curation. 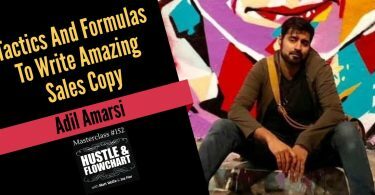 I think that it’s one of the best ways to get fantastic content on your site, generate a ton of value for people, and drive a ton of traffic. However, so many people do content curation completely wrong. What follows is a strategy that utilizes other people's content to create additional value for your readers, benefits the original content creator, and encourages other people to share your content. Following this process will also build your list so you can create your own traffic “at will” in the future. This is a process that we often create and systematize for our clients. In this step, we're going to think of a topic that's going to interest our group. For a “content marketing” blog, I might pick a topic like “10 ways to generate content without actually creating it yourself”. 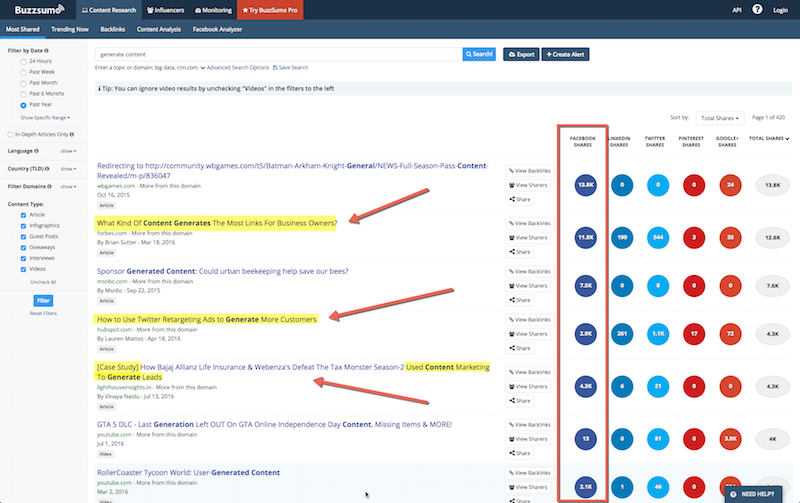 A great place to get some ideas for blog content is BuzzSumo… Simply type in your main keyword and see what's getting shared the most. Now it's time to start curating. Find somewhere in the range of 7 to 10 different blogs that discuss this topic. 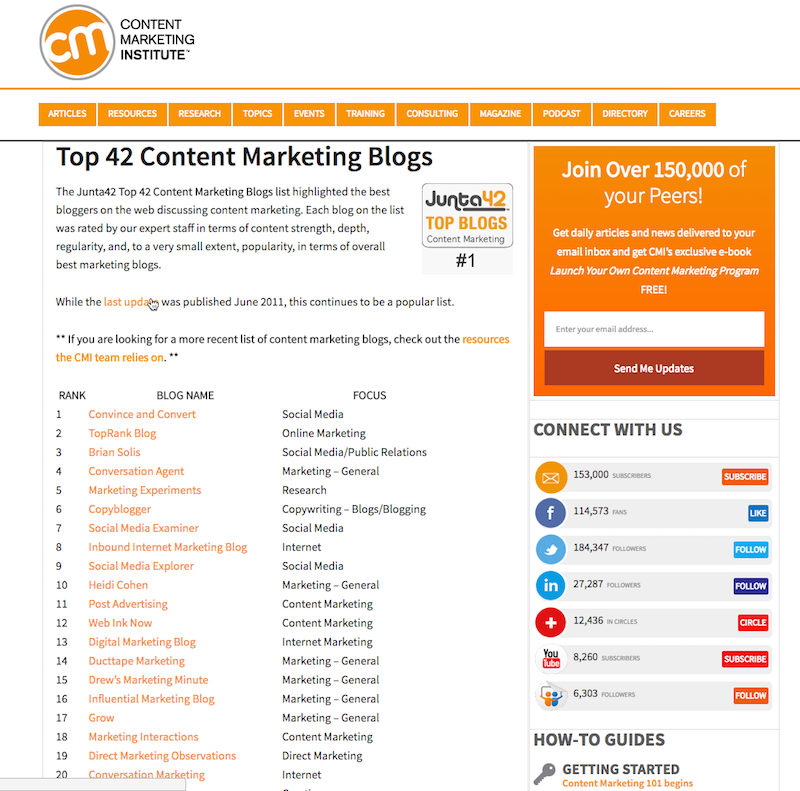 Now find a blog post from each of those sites that best responds to the topic that you chose above. Create the blog post and quote each of the blog posts that you just found. A little bit of commentary to each post about why it fits in this blog post. 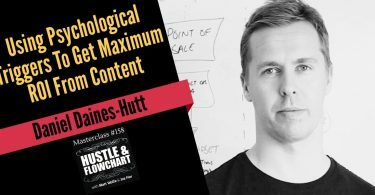 “Content Curation” is one of the quickest and easiest ways to get high-value content on your site, without actually writing most of the content yourself. 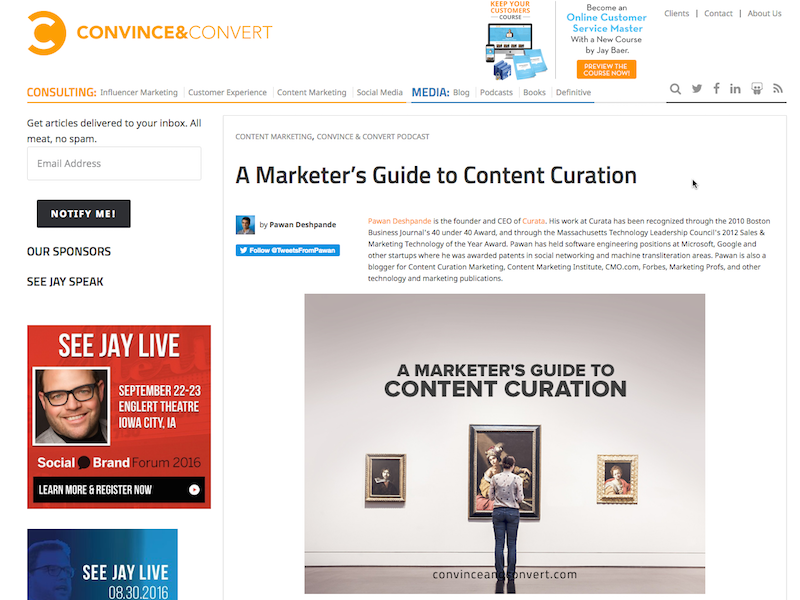 Pawan Deshpande put together a phenomenal guide on how marketers can do content curation correctly. Read the article here. I'd probably go slightly more in-depth with my description… But that gives you a good idea. Make sure that you link out to each of these blog posts and give attribution to the original writer. As a quick note, we use a tool called Kudani to help streamline the process of finding content to curate, posting the content, and properly attributing the content. It's a killer tool and, if you grab it, use the coupon code “MATT30” to get 30% off. This isn't a pitch for Kudani… I just wanted to be transparent that we do leverage that tool to help us find what to post. More about that tool here. 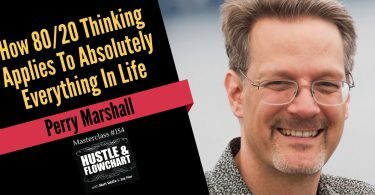 Now it's time to hit Twitter, Facebook, and LinkedIn… I like to hit all three because different people seem to hang out on different platforms, and I want to make sure that the people I mention in the post are aware of the post. 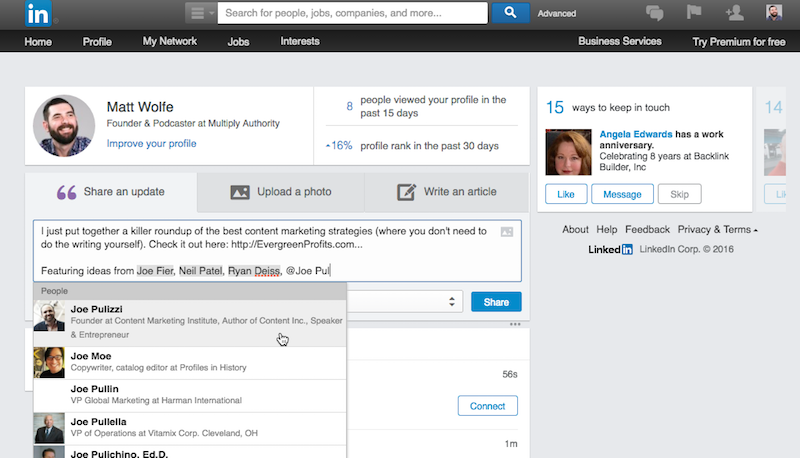 When I share the post on Facebook and LinkedIn, I'll tag every person that I mentioned in the blog post. When I share the post on Twitter, I will create a new tweet for every single person mentioned in the post, letting them know that they've been featured. Finally, if there are contact forms on the blogs that you mentioned, shoot the original author a quick email with a link to your post. Let them know that you featured them in a “best of” type post. 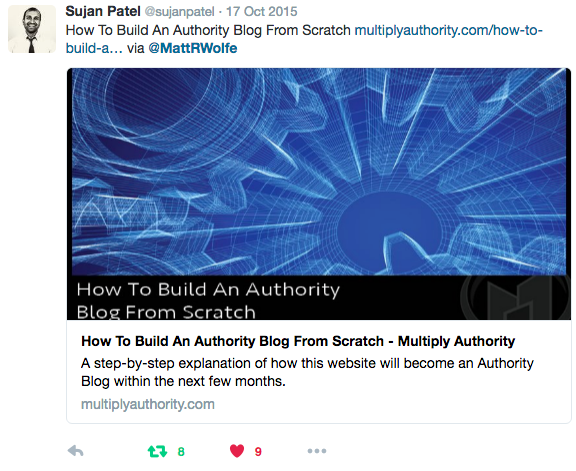 Here's a post of mine that Sujan Patel of ContentMarketer.io shared of mine… He has over 30k followers and gave my site a nice little spike in Twitter traffic. 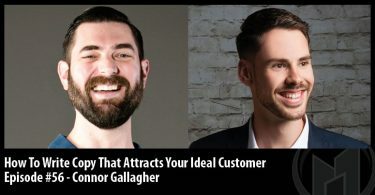 Step 3: Build a retargeting audience. Now it's time to make sure that we turn this newfound traffic into people that return to the site over and over again. Start by ensuring that you're building a retargeting audience in both Facebook and Google Adwords. 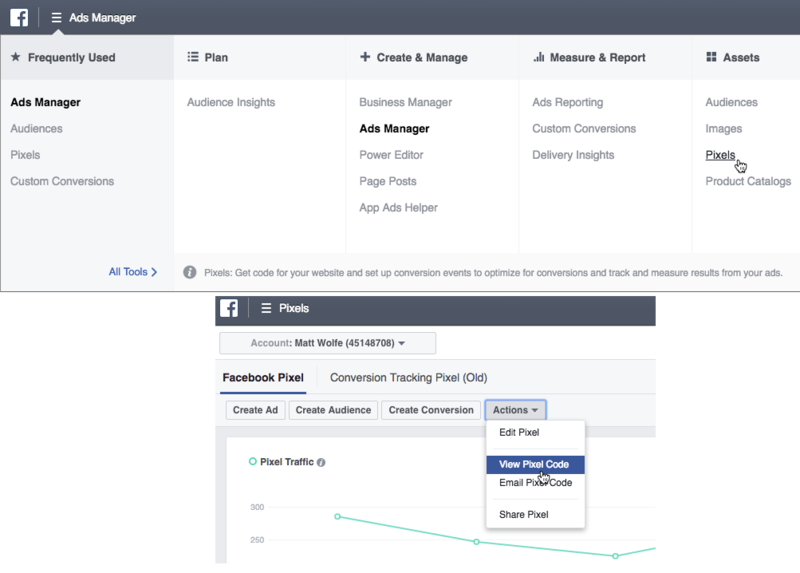 Both Facebook and Google will provide you with a little snippet of code that you can paste into the code of your blog, allowing you to use your previous visitors as targets for advertising. 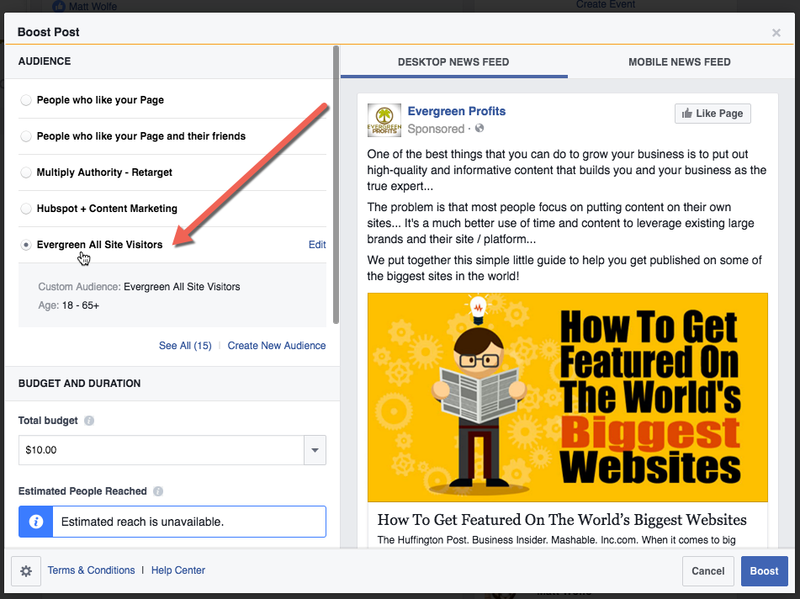 Now, whenever you create a new blog post, link to it from your Facebook fan page and simply “Boost” the post. When you boost the post, you can choose specific targets… Make sure you're targeting the people that have previously been to your website. This gives people the impression that you put out a ton of content and spend a ton of money on advertising. It's amazing for building your brand and driving repeat traffic back to the blog. I don't do a ton with the Google remarketing pixel yet. 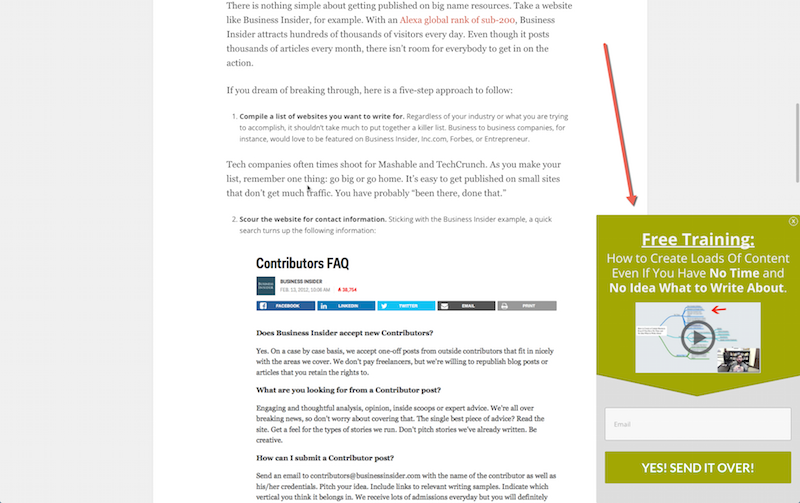 But I put it on the page anyway, just in case I decide to drive traffic from Google ads in the future. Step 4: Collect emails from your blog. Install Thrive Leads… That's the tool that I love and use on this blog as well as on MultiplyAuthority.com. My personal favorite uses are the slide-in tool and the exit-intent lightbox. The slide-in opt-in form slides in from the bottom right of the screen once someone scrolls at least 10% into the content. This is really effective and not overly-intrusive. 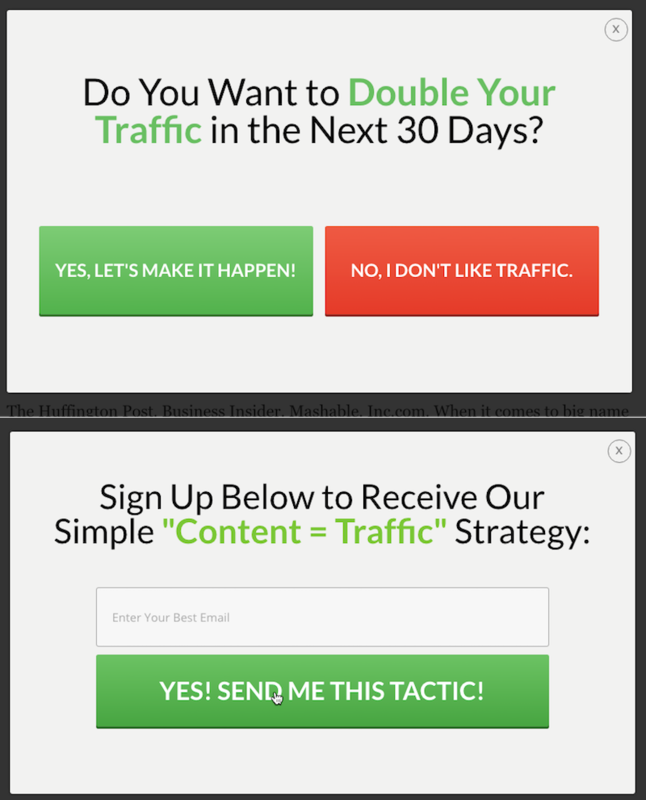 The exit-intent lightbox is the popup that appears when someone moves their cursor away from the browser like they are about to leave the site. These work to grab visitors right before they are about to leave. Make sure you have something valuable to give away for free, in exchange for the email. 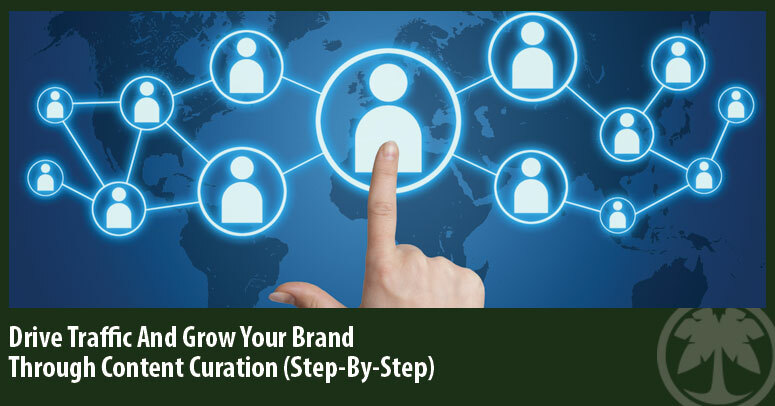 Step 5: Contact your new audience. It's time to bring your newly created audiences back to the site. 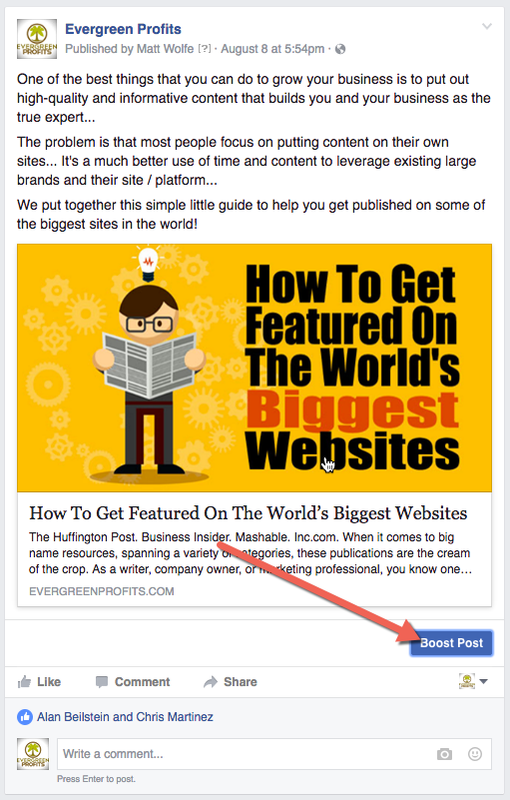 Each time you put a new blog post live, mail your list about the new post and then create a Facebook “Boosted Post” that targets past visitors. I will find an interest target on Facebook that I think will enjoy the post and target them with my ads. This brings some new people to the site that could potentially opt-in as well as new people that will get added to your retargeting list. You can use the process over and over again, targeting new blogs and resources with each new post. Try to use new blogs each time. Other bloggers will, most likely, share your post the first time you do this but, if you do it too often, they'll probably become immune to this technique and stop sharing. So find some fresh blogs each time. Fairly unestablished blogs work fantastic for this because they tend to be the MOST flattered when someone else is talking about them. Always try to include one or two blogs that are somewhat “undiscovered” and watch those people become your biggest evangelists! You can also create “roundup” posts where you send the same question to 50 different people and ask for an answer… Create a post that rounds up all the responses and links back to their website… These get a TON of shares but are a little more time-consuming to build. You will see a post just like this on Evergreen Profits next week. It will make an excellent case study. Hire someone to write original content once you’ve got an audience built up. This will further establish credibility, build trust, and help with SEO. That's it! That's the entire process that we run through when trying to help our client's blogs get some initial traction. 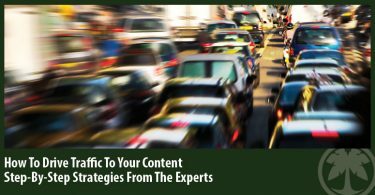 The hardest part about getting a blog going is that initial traffic to the site. Creating posts like the ones described here for the first couple of weeks will give your blog a kickstart and get a lot of people talking about it right out of the gate. This blog is relatively new… Just wait for the case studies that we share with you here!